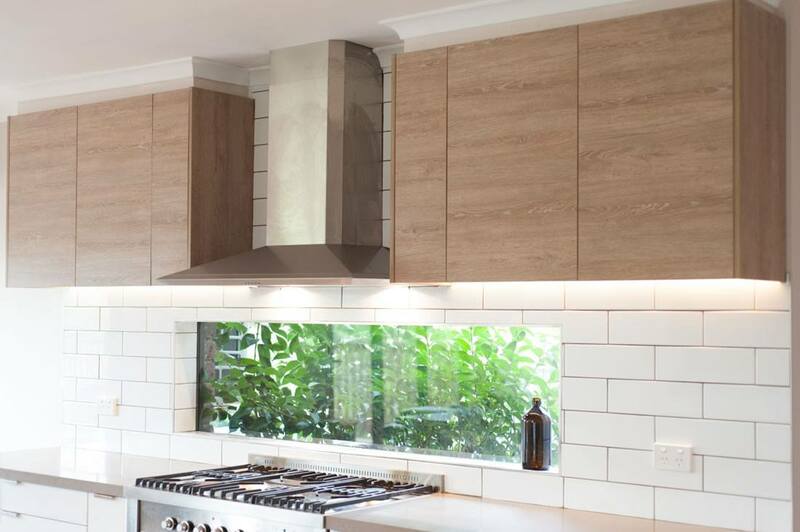 This family moved from Sydney to the leafy suburb of Ringwood and was in need of a complete Ringwood kitchen renovation and laundry overhaul. 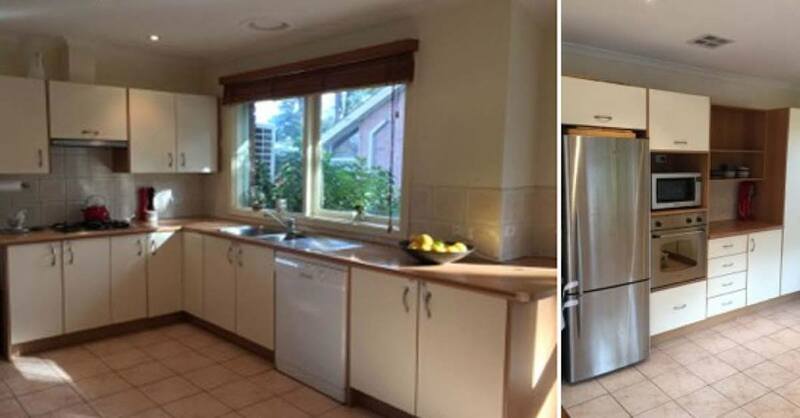 As seen in the photos below, what was once popular in the 70’s with cream cabinetry, pink floor tiles and tight spaces was not conducive to the family’s needs – some major tender loving care was needed. 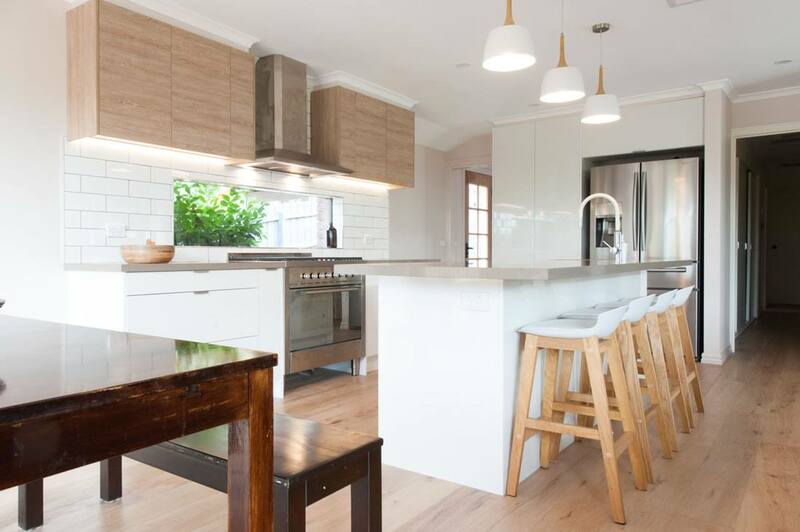 The customer’s brief was simple – create a bright, open spacious kitchen and adjoining butler’s pantry come laundry that would work for the busy family of four. 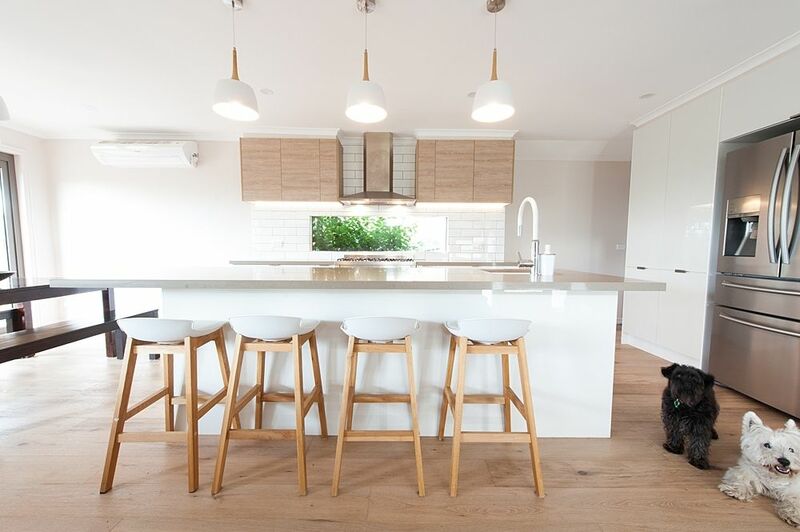 It was important for the kitchen to be the central focus of the home where not only the family could gather daily but also to entertain guests who pop in for a visit. 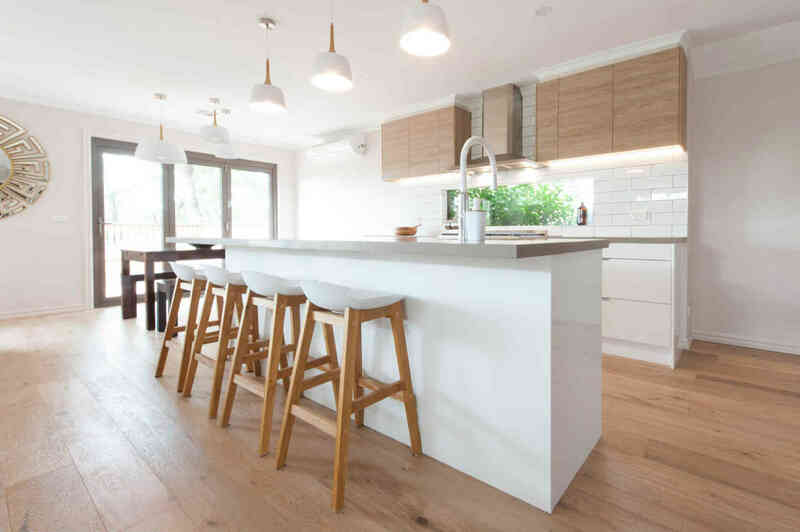 Seating at the large island bench ensures that the kitchen space will remain open and spacious and easily creates extra seating from the adjoining dining table when family and friends gather. This also acts as the perfect seating for their twin daughters and friends while meals are being prepared. As you can see “Gucci” and “Prada” are also very impressed with the transformation. Using a mix of finishes creates the “uniqueness” so desired by the clients. 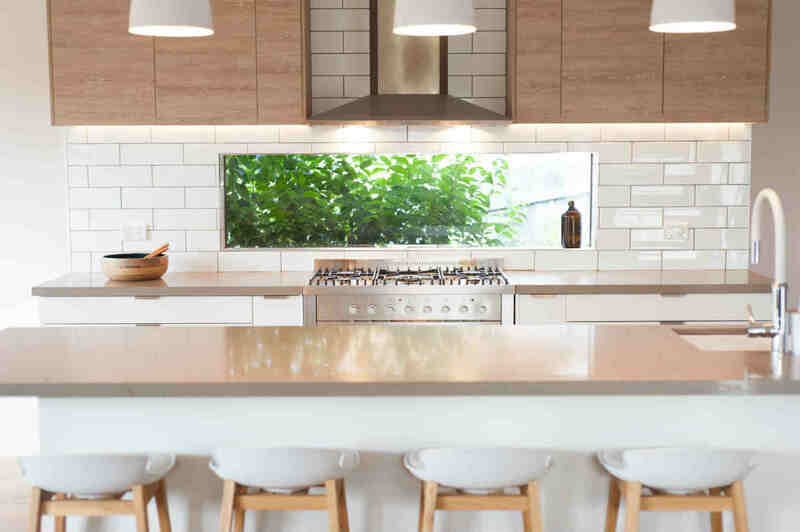 The kitchen is not only functional with soft closing cabinetry, pull out spice racks, pot drawers and loads of storage but also sophisticated with the mix of white Nouveau cabinetry and Rural Oak overheads and large “Ginger” Caesarstone benchtops. The window with greenery almost looks like your natural herb garden at arm’s reach and creates a unique backdrop enhanced by the white subway tiles and stainless steel canopy and standalone oven perfectly centred over the space. Another key design component on the client’s wishlist was storage. This wish has been achieved by designing multiple shelves and cupboards in the adjoining laundry come butler’s pantry. Utilising the same materials and creating a bank of open shelves for additional storage, sets off this space perfectly. The laundry provides the drop point when kids come in the back door to drop their shoes and bags after a busy day. All out of sight of the rest of the open spaces. 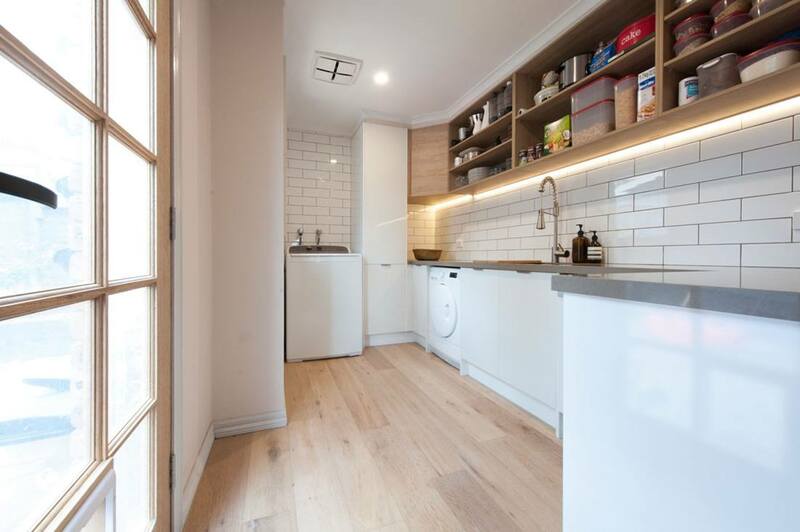 Heaps of bench space for washing baskets and folding of clothes and area that always needs space. 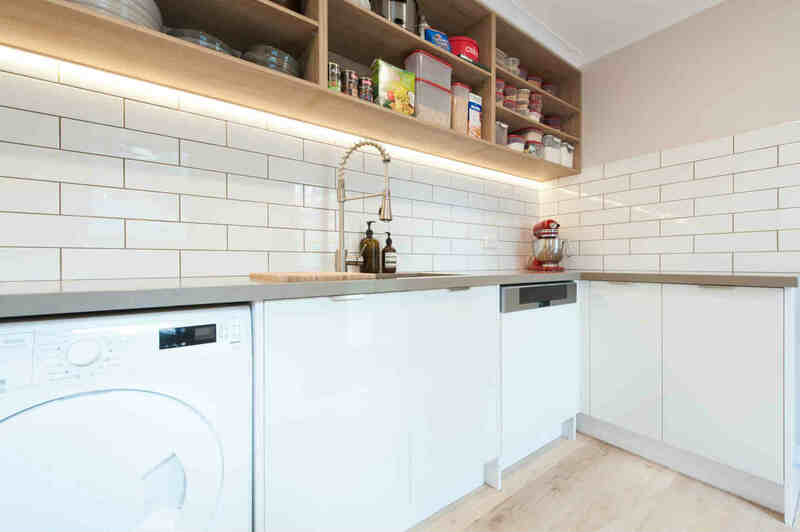 Cleverly designed with a second dishwasher, large sink and loads of bench space for the extra dirty dishes ensuring a clean, clutter-free flow in the adjoining kitchen space. This kitchen, butler’s pantry/laundry transformation has created a true family oasis as well as an entertainer’s delight. Utilising colour and finishes to maximise the space has created a warmth oozing through this family home.